We have four new polls today, one of them significant. Bush and Kerry are now tied in Minnesota. This is bad news for Kerry. He should have been way ahead there. It is now clear that July was a good month for Kerry. He led the entire month. August has been a good month for Bush. He is definitely ahead now. No two ways about it. 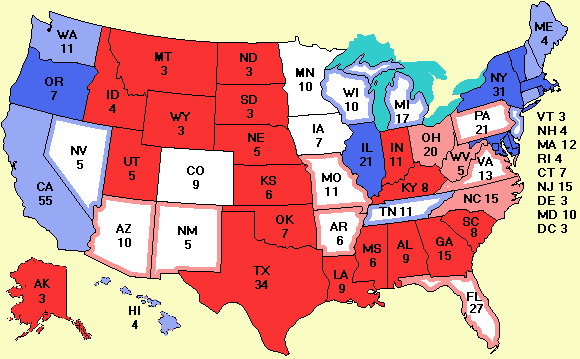 The other polls are in California, Michigan, and New Jersey, all of which still show Kerry in front. Starting today we will track all 34 Senate races. The link on the More data page labeled "The 2004 Senate races" gives a commentary on the key races as well as a link to spreadsheets in both Excel and .csv format. They will be updated whenever new Senate polls come in. Please don't ask for the House. There are 435 races there. Here is a brief summary of the Senate races. The Democrats are defending open seats in five southern states: Florida, Georgia, Louisiana, North Carolina, and South Carolina due to the retirements of five southern Democratic senators. The Republicans are defending open seats in Colorado, Illinois, and Oklahoma due to the retirements of Republican Senators there. At the start of the year, almost every expert said the Democrats had no chance to recapture the Senate since they would have to win five seats in the South just to break even and pick up two Republican seats to boot. Looking at the polls, the situation is completely different now. The Republicans are ahead in Georgia and South Carolina and the Democrats are ahead in Colorado and Illinois, so these races cancel out. Florida and North Carolina are close, but the Democrats currently lead in both. But there are two other key races to watch: Alaska and Louisiana. In Alaska, the incumbent, Lisa Murkowski, was appointed to her seat by her Dad, the governor of Alaska, a move not cheered by all Alaskans. Although she is the incumbent, she wasn't elected and she is facing a popular two-term Democratic ex-governor, Tony Knowles. The polls put Knowles slightly ahead at the moment. This could be another Democratic pickup. Louisiana is a strange kettle of (Cajun-style) fish. Senatorial elections there are nonpartisan and if nobody gets 50% of the vote on Nov. 2, there will be a runoff on a Saturday in early Dec. Currently, the only Republican in the race, David Vitter, has better poll numbers than the two major Democrats, Chris John and John Kennedy, combined, so the spreadsheet reflects this seat as a GOP win. But it is worth noting that both current senators are Democrats, as is the governor. Furthermore, Louisiana has never elected a Republican to the Senate in its entire history. Not once, ever. When it becomes a one-on-one race in the runoff, the Democrat always squeaks through. Then there is Oklahoma, which is a highly Republican state with a highly flawed Republican senatorial candidate, Tom Coburn, who has advocated the death penalty for abortionists. Coming from a former obstetrician who has admitted to performing abortions himself, this kind of recklessness does not endear him to the Republican establishment. If he can get control of his mouth, he might still win, but it is far from a sure thing. Counting Oklahoma and Louisiana as Republican, the spreadsheet says the new Senate will most likely be 51 Republicans and 49 Democrats (including Jeffords) But if I had to guess, I'd say 50-50 appears more plausible right now on account of Louisiana. In any event, the Republican hope of a few months ago of picking up most of the open southern seats and increasing their majority in the Senate substantially is rapidly fading. If you are interested in casting an absentee ballot because you will be away from home on election day, have difficulty getting about, can't get off from work, or just don't like standing in line, and you vote in a battleground state, you can get information about getting an absentee ballot here.